Today I'd like to share an oriental style card I made using the 'Smakin' Acetate' technique. This is a way of creating a shaded background with a few different colours. If you would like to know more then please pop over to my blog and read all about it. The stamps used are by Chocolate Baroque which J&C Creations now stock. They are great stamps with a range of styles at affordable prices. 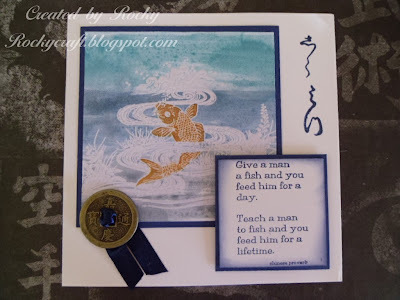 I have also used Distress Stains and Ink pads as well as clear embossing powder. I'm sorry it's a short post today but if you'd like to know more then please click here.